T-Mobile’s Tech Experience lab and its semitruck extension are designed for business partners, researchers and students to get a sense of how 5G and other wireless technology works and their possibilities. T-Mobile’s next magenta-heavy, super-visible campaign won’t be encouraging customers to switch to the company’s cellphone service. Instead, the Bellevue carrier plans to take a decked-out semitruck around the country to showcase its ideas for the next generation of wireless connectivity, 5G, and how it envisions people and businesses making use of it. 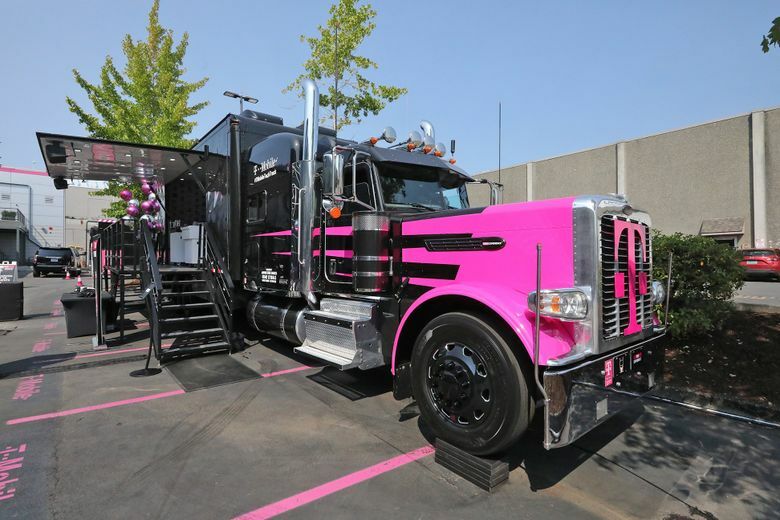 The truck is an extension of the company’s Tech Experience lab, now sprawling throughout the second floor of T-Mobile’s wireless development lab in Bellevue, a few miles north of its Factoria headquarters. Inside that Bellevue showcase, an employee bounces a soccer ball (guess what color) in front of a line of cellphones. Half the phones are set up on the 4G LTE network, the current standard for phones, and the other half are simulating the upcoming 5G technology. Transmitted to the line of phones, the image of the ball follows reality a fraction of a second later on the 5G phones. The LTE phones quickly catch up, but it’s noticeably later. “5G has more speed, more capacity,” said Karri Kuoppamaki, the company’s vice president overseeing 5G strategy. 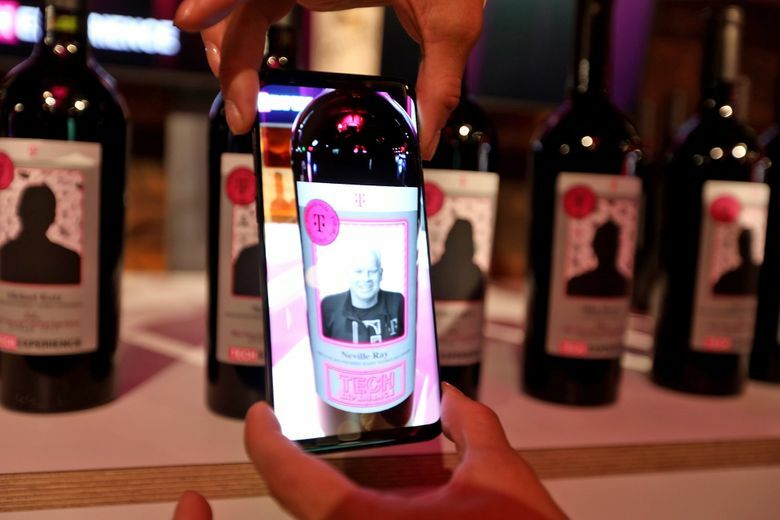 Another demo shows normal labels on wine bottles transforming into talking T-Mobile executives when an app is scanned over them. On a balcony adjacent to the lab, an LTE-connected drone soars into the air, a small demonstration of a larger test the company is conducting with FAA approval in Reno. The lab is not open to the public, rather it’s designed for business partners, researchers and students to get a sense of how 5G and other wireless technology works and their possibilities. Most of the flashy demos inside the Tech Experience lab don’t exist in the wild yet, and won’t until next year at the earliest. 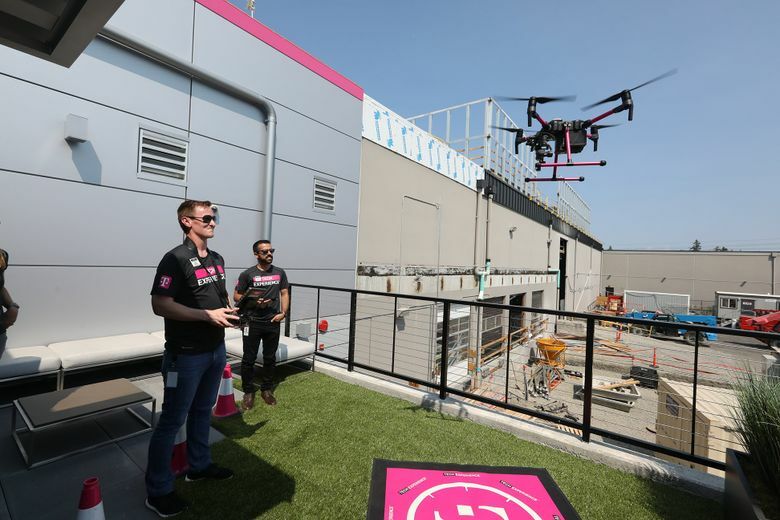 T-Mobile, like its two larger competitors, is building out infrastructure and testing 5G connections in select cities so some capabilities will be ready when phones equipped to handle the next generation of wireless service are released next year. T-Mobile, which has about 6,800 employees in the Puget Sound area, made a deal earlier this year to merge with the fourth-largest wireless carrier, Sprint. The pact is winding its way through U.S. regulatory approvals. 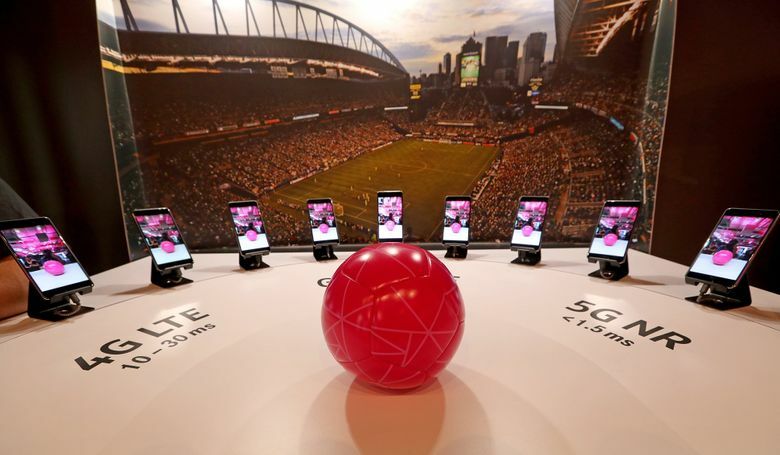 Throughout the deal process, the companies’ third attempt to merge, T-Mobile has emphasized that the two will have much stronger 5G technology as a combined entity, rather than separately. T-Mobile plans to make 5G available in a limited capacity in about 30 cities next year using spectrum it won in a federal auction last year. It has pledged to bring the technology nationwide in 2020. U.S. carriers have big plans for 5G — seamless virtual reality on phones, video downloads in seconds, maybe even remote surgical procedures one day. It’s getting closer, but executives remain rooted in reality. Everything will one day be connected, T-Mobile Chief Technology Officer Neville Ray said in an email, but it won’t all happen next year. T-Mobile has taken its truck on the road, with its first stop in Philadelphia.